April 11, 2019 / Modified apr 12, 2019 10:06 a.m. 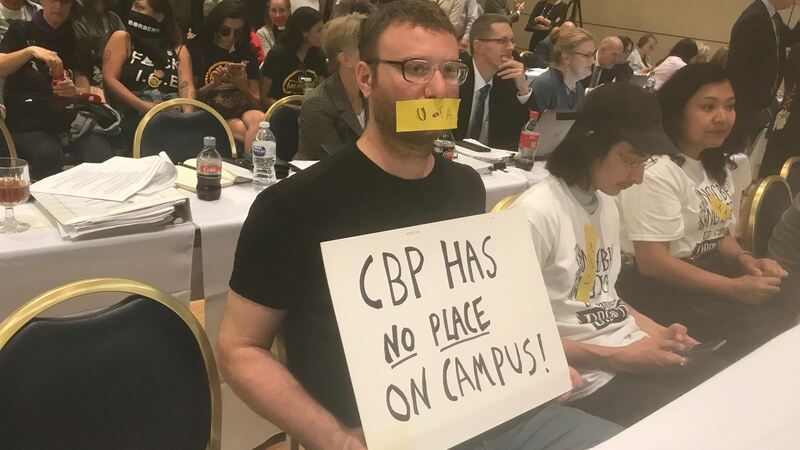 The meeting marks the latest in the controversy over a March protest of Border Patrol by three students, who were issued citations by UA Police. Silent protest by University of Arizona students and supporters at an April 11, 2019 Arizona Board of Regents meeting. They want U.S. Border Patrol banned from campus following events in March that resulted in charges against student protesters. The heat has been turned up on University of Arizona President Robert Robbins over his decision to back UA Police in citing students protesting Border Patrol on campus. 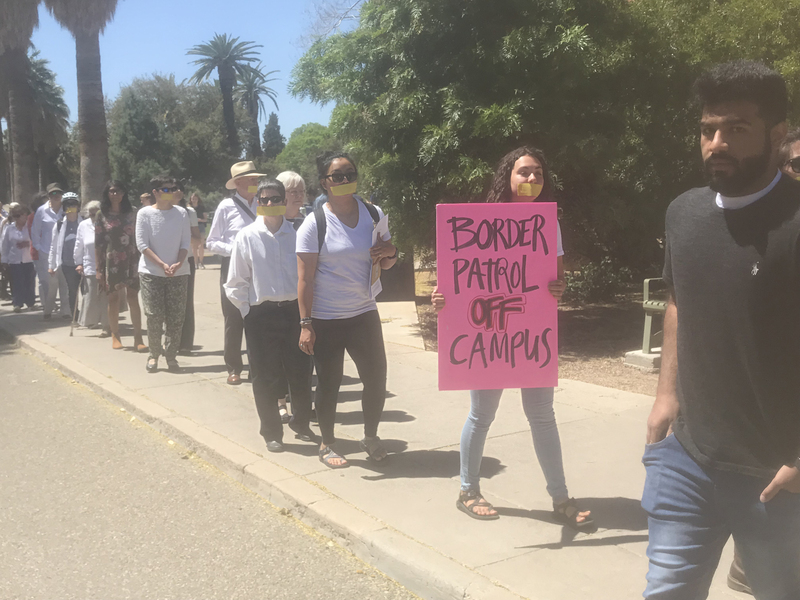 Two protests on campus this week shared the same message: Ban Border Patrol from campus. On Wednesday, more than 300 University of Arizona professors, staff and graduate students walked single file through campus in a silent protest. 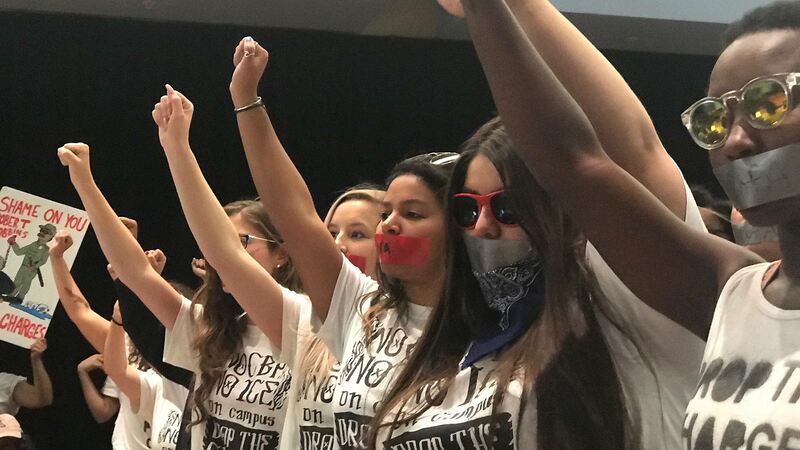 They had their mouths taped shut to symbolize what organizers call "the criminalization of free speech on campus." It all started on March 17 when U.S. Border Patrol agents were invited on campus to speak to a criminology class. They showed up in full uniforms and armed. Three students who interrupted the classroom presentation by chanting "murder patrol," and vulgarities in Spanish, were issued citations by UA Police. Thursday, protesters showed up at the Arizona Board of Regents meeting demanding to be heard. One of them was student Mira Patel. She said that the charges should be dropped against the students and that Border Patrol should be banned from campus. If not, she said the protesters want UA President Robbins to resign. University of Arizona president Robert Robbins is holding a community conversation about the Border Patrol and the larger free speech issue on campus later this month.